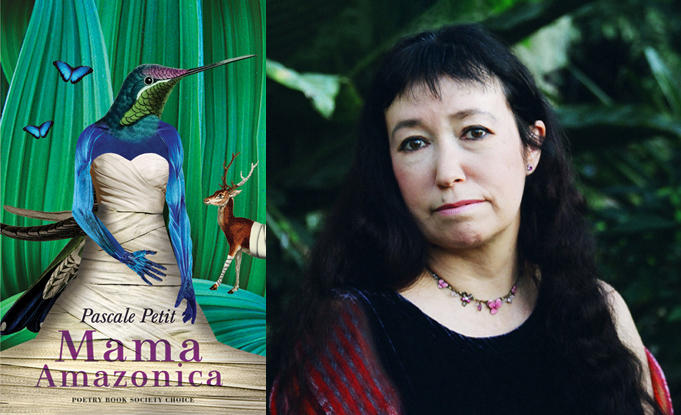 Pascale Petit’s seventh poetry collection Mama Amazonica, awarded Poetry Book Society Choice for Autumn 2017 and shortlisted for the Roehampton Poetry Prize 2018, won the RSL Ondaatje Prize 2018 - the first time in the prize's 15-year history that a poetry title has won. Pascale launched the book in September 2017 with readings at King’s Lynn Poetry Festival, North Cornwall Book Festival, The Cheltenham Literature Festival and at the Hay Festival Winter Weekend, with further appearances at festivals in 2018, including Birmingham's Verve Festival in February and the Cuirt Festival in April, Ledbury Poetry Festival in July and Winchester Poetry Festival in October. She appeared at Birmingham Literature Festival and Poetry in Aldeburgh in October and November 2018. Mama Amazonica is set in a psychiatric ward and in the Amazonian rainforest, an asylum for animals on the brink of extinction. The book tells the story of Pascale Petit’s mentally ill mother and the consequences of abuse, as well as celebrating the beauty of the wild, whether in the mind or the natural world. As the PBS selectors note: ‘…her greatest, most singular achievement has been to tackle difficult subject matter head-on, while simultaneously distancing herself from it through the use of exotic metaphor.’ Pascale has commented that it is a book that took her ‘63 years to write’. Pascale was a guest on Radio 3's The Verb of Friday 19 October 2018. She was discussing the forest as metaphor with host Ian McMillan and writer Terry Deary. Still available to list to via BBC Sounds here. For more interviews with Pascale, click here. Pascale Petit and other winners of the RSL Ondaatje Prize took part in a special event at the British Library on 16 April 2019 to celebrate 15 years of the Prize, and to discuss writing that celebrates the spirit of place. This event was recorded for BBC Radio 3's Free Thinking, and will be broadcast on Wednesday 1 May, 10pm. Listen live, or after broadcast here. Click here to read Pascale's blog and see photos of her trips to the Amazon. An interview with Pascale Petit is in the March 2018 issue The Compass Magazine, illustrated with her own photographs. Click here to read.